Every now and again on ChemEng365, we venture away from the many ‘game-changing’ developments and achievements in chemical engineering that help to change the engineering landscape. Today, we are digressing into the world of business start-ups, entrepreneurship and digital printing. 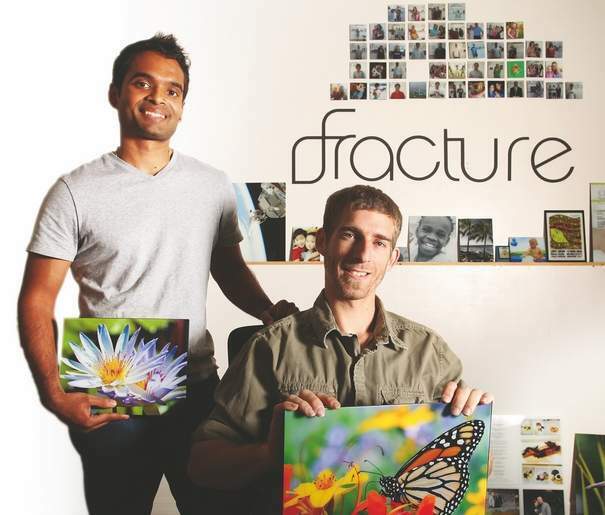 Our story centres on Abhi Lokesh and Alex Theodore, who co-founded Fracture – a small digital print business with a difference. We haven’t strayed too far away from chemical engineering though. Alex is a chemical engineering graduate from the University of Florida. He may not be involved in typical chemical engineering roles in the energy, health, food and water sectors, but his engineering talent and vision are still being used… to put smiles on peoples’ faces. If you think about traditional pictures and framing, there are a number of components – the frame, the picture, a mount and a glass protective cover. Fractures are different from traditional pictures and frames. They combine all elements together. Instead of printing on paper, they print directly onto glass and combine all elements together into a beautiful and lasting product. The engineering behind Fracture is Alex’s domain and something he’s helped to develop with Abhi over several years – initially as part of some volunteer work during their University days. Alex graduated in 2008 with a Bachelors in Chemical Engineering, but during his academic stay he steadily progressed in research under the departments of Environmental Engineering and the Particle Engineering Center. Most of the projects he led or assisted started as novel inventions or ideas, where he became both a prototype designer and fabricator. These experiences became the building blocks for his future endeavors. A big step on his journey was joining a a group of social entrepreneurs in 2006 to develop a hybrid nonprofit/for-profit organization. Acting as the technical leader of the for-profit wing, he and Abhi developed an unique online art gallery that generated revenue for the nonprofit from printing and framing sales. This work financed some volunteer work in Swaziland, Africa, to help alleviate a health and poverty epidemic faced by the country, and also became the forerunner of Fracture. Fracture’s underlying technology is really a combination of industrialised printing machinery and Alex’s vision regarding utility, workflow and engineering. His colleagues point to his ability to envision how particular equipment can be used to achieve a certain result or output, and then engineer it to become a reality. Chemical engineering talent can take many forms and so does the ability of our profession to improve quality of life – whether on a huge scale like mitigating climate change to branching off into a new field with the development of a novel printing process which brings to life some of our most personal and treasured memories. Alex’s story is a welcome addition to our celebration of chemical engineers and the difference we can make. Are you a chemical engineer that has pursued a different career path? Please tell us your story.